Revive skin and coats with the non-irritating, pH balanced formula in Pooch Botanique Hypoallergenic Shampoo. This unscented, crystal clear shampoo gently exfoliates leaving the epidermis free to breathe without hindrance from the heavy residue left behind from some other brands. 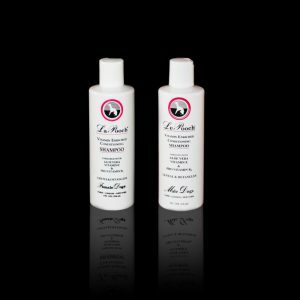 It is the perfect purifying cleanser to prepare your pooch for delightfully scented finishing shampoos, conditioning crème rinses, or soothing medicated products.